Viola Davis, during the Toronto International Film Festival in Toronto on Sept. 9, 2018, (l), and Congresswoman Shirley Chisholm, D-N.Y., the first black woman elected to Congress, in 1971. Davis is gearing up to play groundbreaking politician in a film for Amazon Studios. The company said Thursday, Nov. 29, that Davis has signed on to star in and produce the project about Chisholm, who was also the first woman to seek the Democratic Party’s presidential nomination. 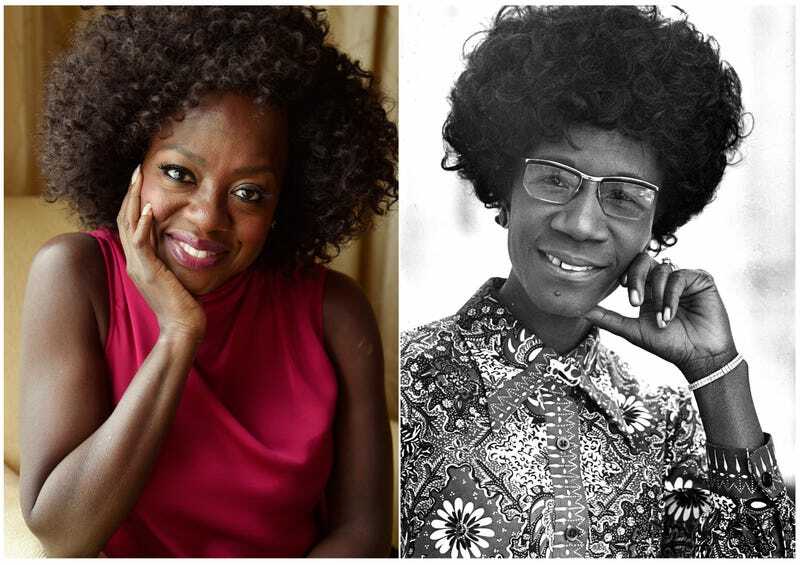 Amazon Studios has acquired the rights to The Fighting Shirley Chisholm, and they have announced that Oscar, Golden Globe, Tony and Emmy Award-winning actress Viola Davis will not only star in the title role, but help produce the film as well. With a script written by Emmy-nominated writer Adam Countee (Silicon Valley, Community, Mindy Project), the film will tell the true story of U.S. Rep. Shirley Chisholm, who was both the first woman and the first person of color to seek a major American political party’s nomination for president. Although her bid for the presidency drew ridicule and bigoted backlash, Chisholm did not back down. Countee had long been interested in telling the story of Chisholm’s bid for the presidency, and his research led him to write the feature script on spec. Davis can currently be seen in theaters in the critically acclaimed Widows as well as on the popular ABC drama How To Get Away With Murder. In 2019, she will star in Amazon Studio’s Troupe Zero, alongside Alison Janney and Jim Gaffigan. The Fighting Shirley Chisholm will be produced by Stephanie Allain (Hustle & Flow, Dear White People) and Mel Jones under Homegrown Pictures and Viola Davis and Julius Tennon under their JuVee Productions banner. Maggie Betts (Novitiate) will direct the project. This film is going to be a gem. We can’t wait to see Viola bring Shirley Chisholm’s story to life.